No job is too big or too small for our Watch Repair team! We have performed thousands of watch repairs at our dedicated facility. We service all different types of watches, from brand name luxury timepieces to antique heirlooms! 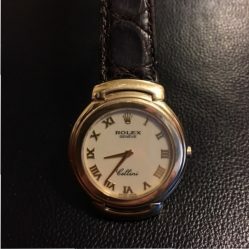 Master Watchmaker Guido Calvetty Alave and his staff of watch repair professionals are prepared to handle everything from battery replacement to replacement of movements, to custom restorations. Accutron repairs in Washington DC and Northern Virginia area. Hamilton, military repairs, IWC, Minute repeaters, perpetual calendars, pocket watch service, Atmos clock service, music box service, singing bird automatic service and cuckoo clocks service. Visit our watch battery center.